The Principal of the Day Dean Wetter from Valley-Wide Recreation & Park District with WES the mascot and Principal Mark Delano at Winchester Elementary. 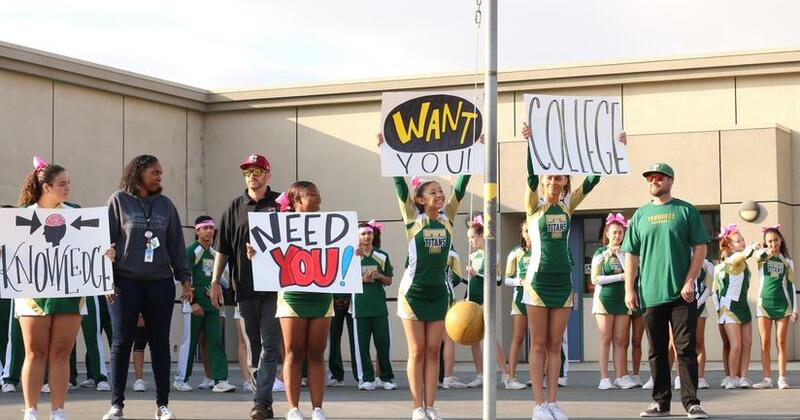 Tahquitz cheerleaders helping Cawston students with a song about college. Cawston student holding the flag as students say the Pledge of Allegiance at the Friday Flag Ceremony. Maya Flemming signing her commitment letter at Tahquitz's College and Military Signing event. 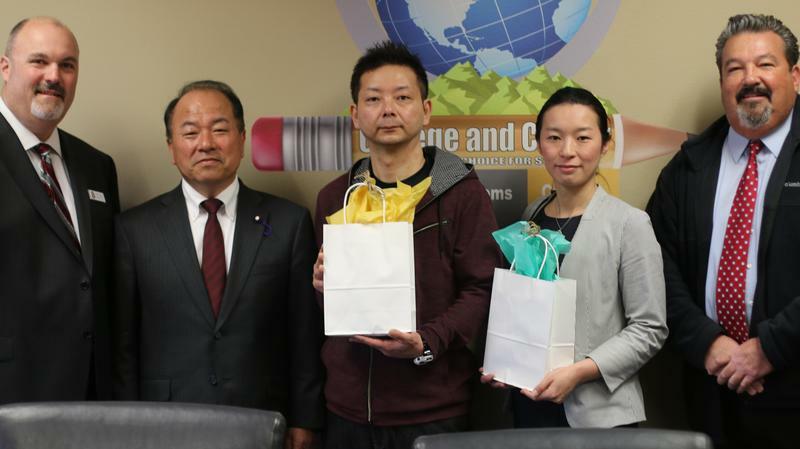 Hemet Unified students that are advancing to the International Engineering and Science Fair. The 41st annual Hemet Unified Spelling Bee winners! Dartmouth ASB recognized at the Hemet City Council meeting for their float in the Christmas Parade! West Valley's Band recognized at the Hemet City Council meeting for their float in the Christmas Parade! Dartmouth Girls' Volleyball team league champions! Rancho Viejo's Flag Football team named League Champions for the third straight year! West Valley JROTC members saluting the American Flag as it's being raised. Hemet High's JROTC cadets Presenting the Colors while veterans, first responders, and community members stand and show their appreciation. Superintendent Barrett speak with Governing Board Vice President Joe Wojcik and Supervisor Chuck Washington during the Hemet Elementary Dignitary Tour. Current and former HUSD staff members at the Hemet Elementary School Dignitary Tour. Tahquitz High School's baseball team named CIF Southern Section Division Four Champions! Summer School graduates turning their tassels as they become a part of the graduating class of 2017! District Office staff in line at the In-N-Out truck for the end of the school year celebration. Board Trustee congratulating Michael Cooper on receiving his high school diploma. Western Center Academy Principal Paul Bailey congratulating Salutatorian Cole Alley. Miguel Barajas walking off the stage after he received his diploma. Caleb Farmer taking a selfie as he receives his diploma. Nancy Ferraz, Hemet Adult School graduate, celebrating after receiving her high school equivalency 50 years later. Helen Hunt Jackson College Prep student's graduation cap. 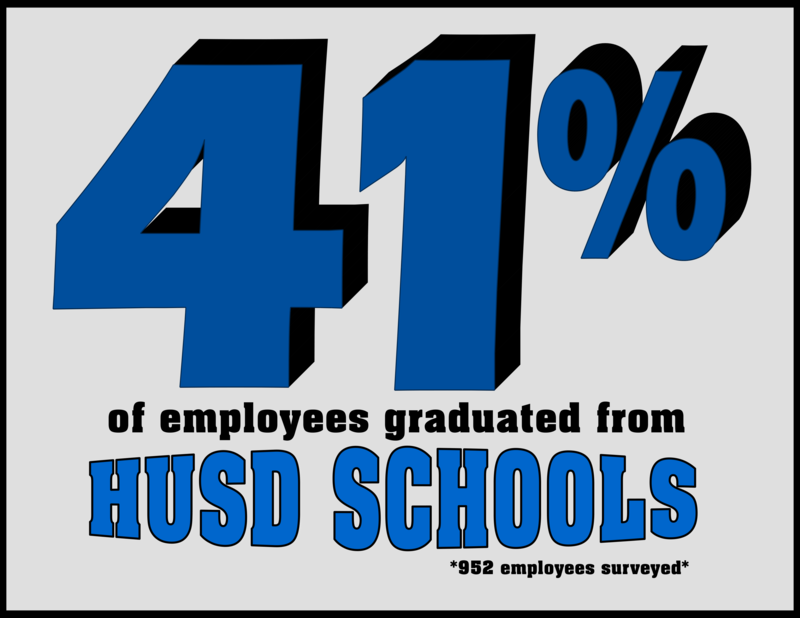 Mother and son graduates from Alessandro High School and Hemet Adult School. Alessandro High School and Hemet Adult School 2017 graduates! ASPIRE student, Kyle Roberts, receiving the Governing Board Scholarship at the first ASPIRE Graduation. ASPIRE student, Aleea Diamond Moore, hugging Superintendent Barrett as she receives her high school diploma. Diamond Valley Middle School student, Jacen Moore, nominated his history teacher, Mrs. Turner for the Teachers are Heroes Award. Delilah Warren, Benjamin Corcoran, and Zuleika Serna place first in the district's second annual Design Challenge. 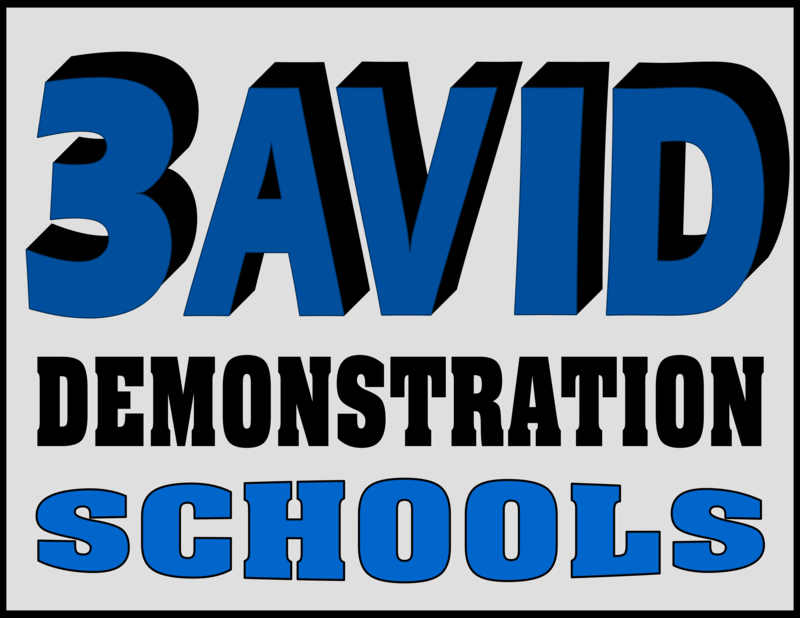 Dartmouth Middle School named an AVID National Demonstration School for the first time in the school's history. Superintendent Barrett reading to Ms. Ollerton's 2nd grade class in honor of Read Across America Day. Tahquitz's Cheer Team at State, they advanced to Nationals and will be competing March 24-26. West Valley's Cheer Team at State, they advanced to Nationals and will be competing March 24-26. Hemet High's Cheer Team at State, they advanced to Nationals and will be competing March 24-26. Army Veteran and retired Hemet Police Officer, John Gibson, reading to Ms. Kirkendall's classroom at McSweeny Elementary. Tahquitz High School cheerleaders reading to students at Jacob Wiens Elementary for Read Across America. Father and son reading at Fruitvale Elementary's Read Across America event. Deputy Loza reading Green Eggs and Ham to Mrs. Andersen's kindergarten students for Read Across America Day. Board Member Megan Haley reading Hand, Hand, Fingers, Thumb to Ms. Holland's class. Carlos Navarro, Director of State and Federal, reading to students at Jacob Wiens Elementary. Ethan Corum, Western Center Academy, tied for second place in the 40th annual Riverside County Spelling Bee. 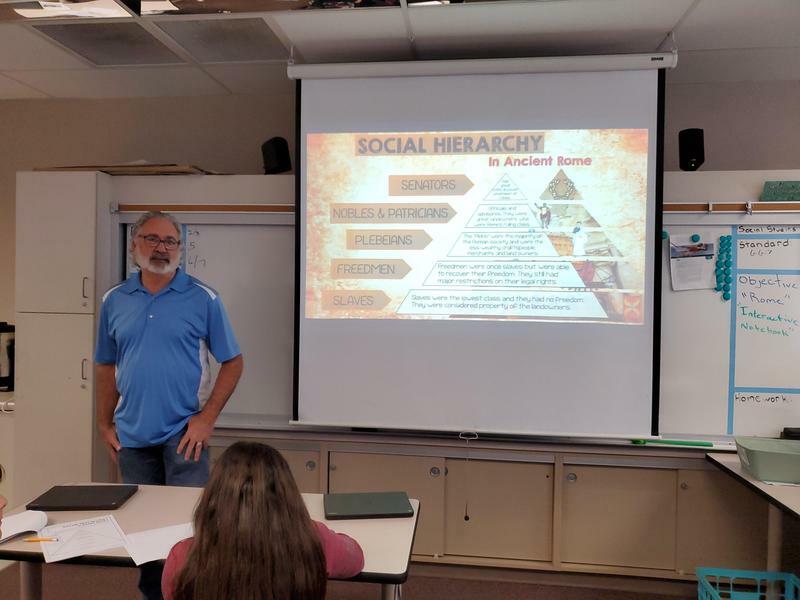 Rancho Viejo Middle School was re-validated as an AVID Demonstration School. 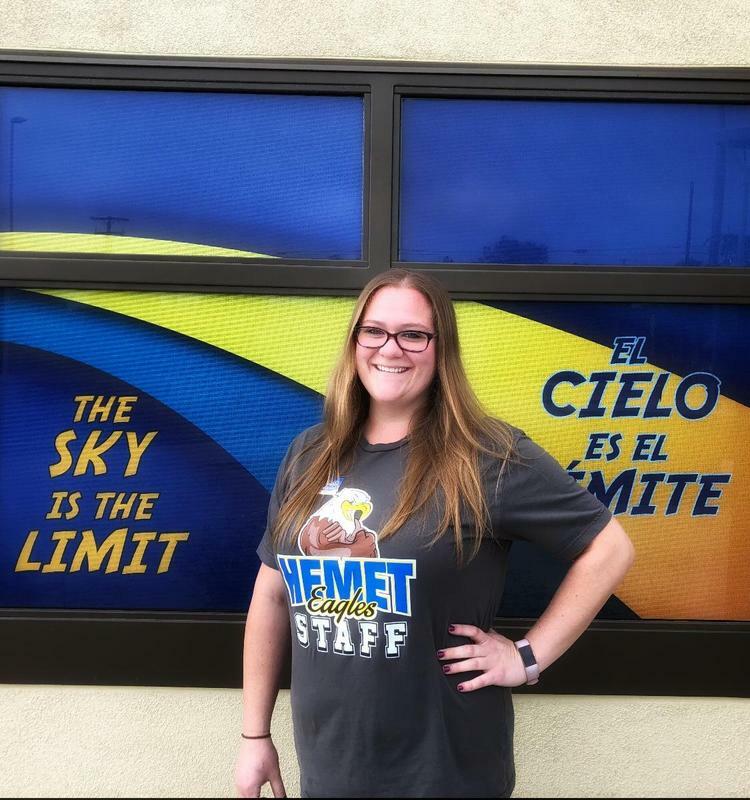 Yolanda Duran the Classified Employee of the Year will represent Hemet Unified in the county competition. Keyera Cameron won 2nd place in the NFL Punt, Kick, Pass for girls 8-9 years old. Western Center Academy's Assistant Principal Michael Horton, first place winner Ethan Corum from Western Center Academy, second place Damara Cormier Acacia Middle School, third place Katelynn Brennan from Acacia Middle School, and fourth place winner Aileen Luke from Western Center Academy at the 40th annual Spelling Bee. 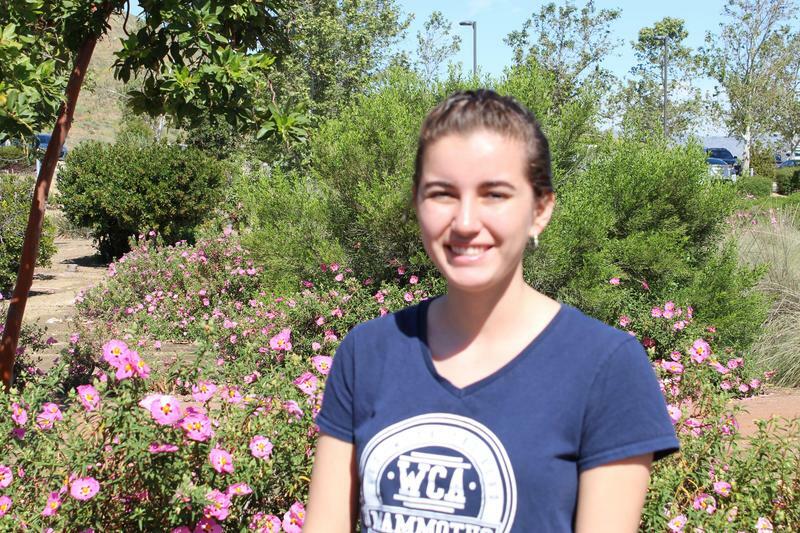 Hemet and San Jacinto Students of the Month for January. Superintendent Barrett administering the Oath of Office to the new and returning board members. Counselor Aida Sandoval introducing recent high school graduates at Cawston's Friday Flag. Former Tuskegee Airmen Theodore G. Lumpkin and Robert Lee Porter looking at ASPIRE student's posters representing Tuskegee Airmen. Board President Vic Scavarda recognizing Kaitlyn Stuve, a Whittier fifth grade student, for leading the Pledge of Allegiance at the board meeting. Superintendent Christi Barrett reading the Polar Express during West Valley's Yes I Can program's performance for Harmony Elementary first graders. Applicants are needed for Category II: Active in a senior citizens’ organization Click here for the application! With a week to create a design submission, Nicole worked around the clock to artistically represent California by graphic design. 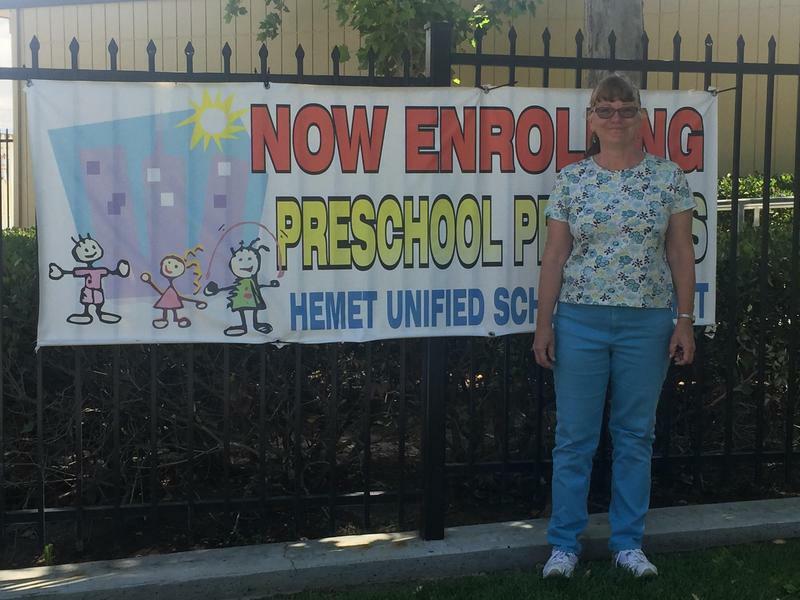 Hamilton Preschool eleven year veteran teacher Sue Mrsny is Faculty Focus Friday! Sue arrives to work with an eagerness to enrich the knowledge of students to be kindergarten ready. The preschool program will miss Sue’s dedication, critical approaches, love of learning, and passion for children and families. Best of luck to you Sue in your new adventures with retirement and thank you for the positive impact you have had on our students. 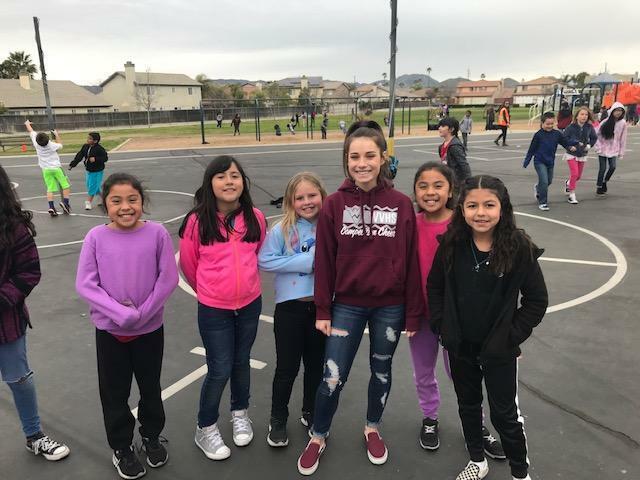 Rebecca Rebuck is Faculty Focus Friday from Hemet Elementary School! Rebecca is the health tech in a busy and supportive health office. 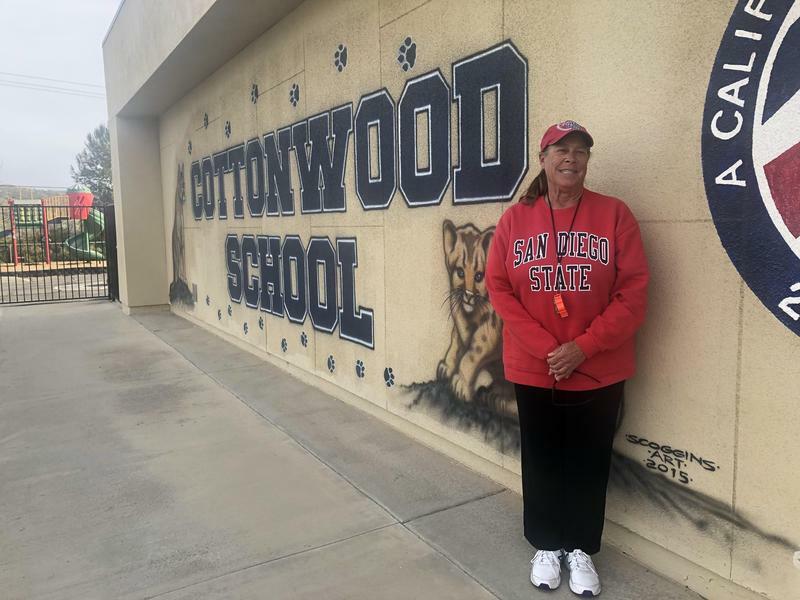 She is known for her positive disposition and goes out of her way to ensure students feel safe, supported and loved. 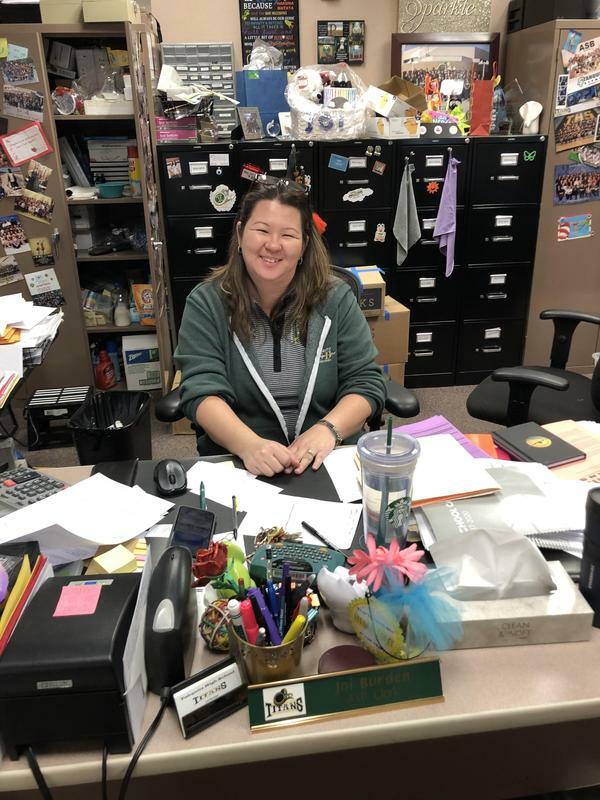 Rebecca works tirelessly to support all school stakeholders with resources and makes a difference in the lives of students daily. 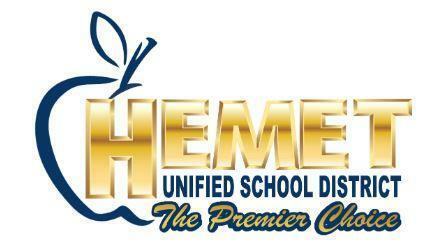 Thank you, Rebecca, for your premier work at Hemet Unified School District!